This small beetle (~4mm) is shiny black with a blue reflection. It has a rounded pronotum which becomes strongly sinuate at the base. The elytra have 7 deeply punctured striae (plus a short scutellary stria) with two pale sub-apical spots. The antennae are dark but with a pale basal segment and the legs are pale brown. 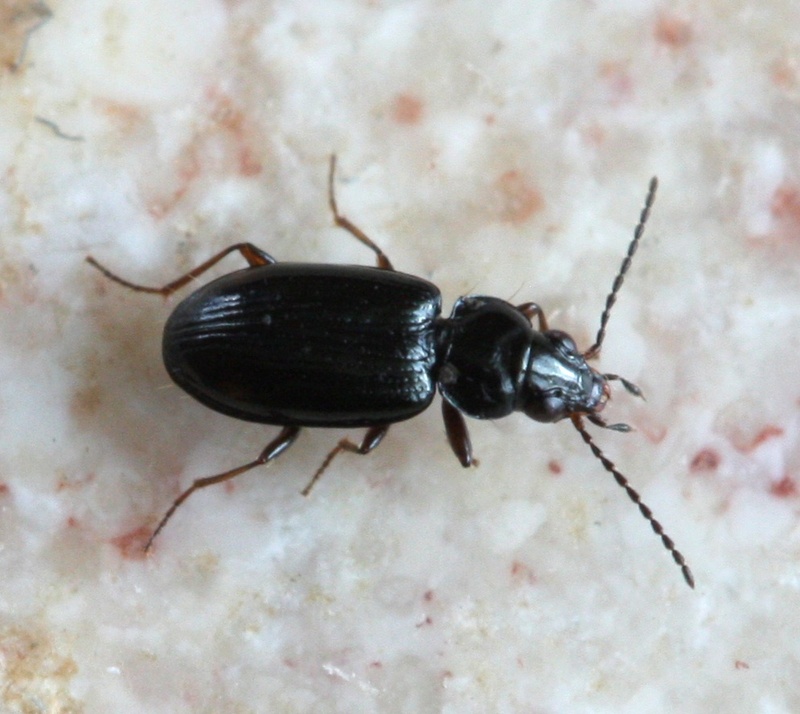 Bembidion lunulatum is of similar size and also has rounded sides to the pronotum. It also has pale sub-apical spots but the basal antennal segments are dark. It also has dark brown legs and only 6 punctuated striae. Bembidion guttula is smaller (3-3.7mm). The pronotum is also rounded but with a more prominent corner before the sinuate base. The pronotum is also narrower than the elytra. The legs and basal antennae are mid brown. Bembidion doris is another species with sub-apical spots but here the pronotum sides have a squared base. Unless identified by a recognised expert, a photo is required and the specimen should be examined with a microscope. In the comments box, state the key or ID method used and describe the size and identifying characters. Often found on mud and silty ground near to water. Very common and widespread in England and Wales.